Jobu Reviews the Yankees three game series in Seattle against the Mariners. I was expecting a nice, easy series with Seattle after the debacle that was the series against the A’s. I was hoping for a nice quiet sweep, or for the Yankees to take two out of three without much effort (any time you face King Felix in a series, it’ hard to hope for a sweep), but we got a whole lot of news before the series even started. Just before game one, the Yankees traded for Ichiro (we covered that here), and before the series ended, the Yankees would find themselves trying to fill two months without their starting third baseman. As for the actual series, the Yankees used a thrilling game three comeback to take the series two games to one. Here’s how it went down. Talk about a media circus in game one. The Yankees debuted their new left fielder (although he played right in the game because of Swisher’s injury) Ichiro in his old stadium, against his old team. How awkward. 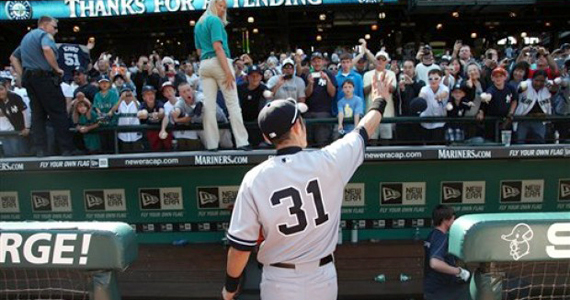 At least the fans treated Ichiro with the respect he deserved, which they continued throughout the series. Stay classy, Seattle. Anyway, the Yankees sent Hiroki Kuroda to the mound against the ageless Kevin Millwood. Both guys pitched well, but the Yankees ended up on top. As RAB pointed out the other day in a solid article, Kuroda is proving that pitchers really can make the NL to AL switch and have success. Many have failed before him, but Kuroda continued his exceptional pitching against Seattle in the series opener. Hiroki simply dominated this weak Mariners lineup, which is what he’s supposed to do against them, so that’s great. Kuroda’s splitter was once again working, and he ended up with the following line: 7 Ip, 3 H, 1 R, 1 BB, 9 Ks, 107 pitches and his tenth win of the season. Robertson pitched a scoreless eighth and Soriano nailed down the save in the ninth. The Yankees only had one rally against Millwood in this game, but it was enough for the win. It came in the top of the third. Alex Rodríguez doubled and Robinson Canó walked before Mark Teixeira came up and smacked a double down the right field line. It scored A-rod and moved Canó to third, and those two scored on the subsequent singles by Raúl Ibañez and Andruw Jones. Those three runs were really all the Yankees would need, which is good because they didn’t score another run until A-Rod hit his 15th home run in the top of the eighth. As I said earlier, any time you’re facing Félix Hernández, you’re probably going to lose, so it’s important to not get your hopes too high. Last time the Yankees face King Félix, they actually managed to beat him, but surely that wouldn’t happen two days in a row… Especially with Freddy García pitching… right? Actually, yes that’s exactly right. The Yankees only managed two runs in the game and, although Freddy pitched great, the Yankees took another close loss. I guess it’s better than 11-2. Freddy probably earned himself another start with the one he threw against the Mariners in game two. Facing one of his best friends in baseball, against his old team, Freddy stepped up. He had one real bad inning, when he allowed two runs in the bottom of the xth, but that was really helped by some great, aggressive base running by the Mariners. The other run came earlier in the game on a solo home run by Michael Saunders, which is going to happen when you throw 88 mph. Freddy was inexplicably pulled in the bottom of the eighth despite only having 89 pitches and retiring the last 15 men he had faced, but his final line looked like this: 7.1 Ip, 5 H, 3 R, 0 BB, 8 Ks, 89 pitches and his fourth loss of the year (4-4). Joe Girardi really made this a 4-2 game. After removing García for no reason, he used Clay Rapada, Chad Qualls, Boone Logan and Cody Eppley to get the last two outs of the inning, with Logan allowing a crappy Willie Mays-Hayes style infield single to score the fourth run. He made a nasty pitch that completely fooled Kyle Seager, who excused one down the third base line. Chavez never stood a chance. Thanks, God. No, WWE superstar CM Punk was not involved with the Yankees offense, but King Félix really showed why he’s the King in this one. He kept the Yankees off the bases and, when they actually managed to get threats together, he fought them off and put the Bombers to bed. The Yankees had a poor RISP game (2 for 10), and left the bases loaded in the fourth, but that was really more because of Hernández’s good pitching and not their failures. No shame in losing to the King. 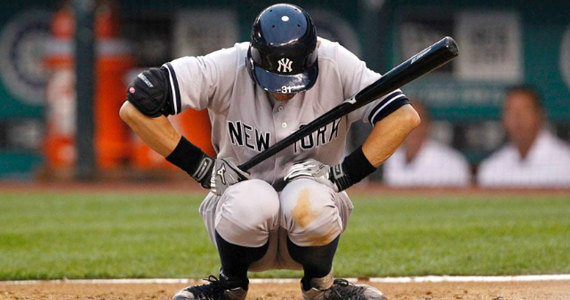 There is shame, however, in what Girardi did in the eighth. The Yankees finally got a rally together (after Hernández basically hit everyone he pitched to) and managed to score a run and get first and second with two out for Raúl Ibañez. The problem is that Ibañez was digging in against a lefty… a really good lefty named Lucas Luetge with a 1.37 ERA. Common logic would have said to put Andruw Jones in the game. After all, that’s literally why they signed him the last two seasons. The Mariners would have countered with Brandon League, but still. Ibañez is just awful against lefties, and he struck out to prove that point. Thanks, Joe. I guess a win in game two was part of the Ichiro trade. Let’s face the facts here. The Yankees needed to win game three of this series, if not for any other reason than their own sanity. They were facing a 1-5 on the road trip coming in and had just lost their third baseman for two months with a broken hand… Something had to break the Yankees way, right?? It took until the top of the eighth inning, but something finally went right for the Yankees in this one, and they escaped Seattle, and the whole West Coast road trip, with a big morale boosting victory. I don’t know what happened to Iván Nova in this game, but to say that he was having trouble finding the zone is about as big an understatement as if I were to tell you that Joseph Stalin was a little harsh on subversives in Soviet Russia. Nova walked in a run in the first inning, and six overall in the game. His control was so bad that he needed over 100 pitches to get through the fifth inning, and he didn’t even allow a hit after the first! How does that happen? I do give him credit for battling himself for those five innings and making sure he kept his team in the game and making that late inning comeback possible. His final line looked like this: 5 Ip, 2 H, 2 R, 6 BBs, 5 Ks, 107 pitches and a no-decision. Rapada came in to get the first two outs of the sixth and he was relieved by David Phelps. Phelps continued to turn heads all over the Yankees organization by pitching 1.1 blistering innings, not allowing a base runner and striking out two. Maybe putting him in the rotation isn’t the answer if he’s going to pitch like this out of the pen. He’s been incredible since they called him back up, and he got the win in this one. As is almost always the case, Robertson came in and pitched a scoreless eighth before Soriano shut the door in the ninth for his 26th save. Good to see him bounce back in this series after Sunday’s blown save. In the Nix…of Time.. Ah? Things got off to a hot start in the top of the first when Jeter, who was batting second behind Ichiro (I liiiiike) hit an absolute bomb to right-center for his eighth home run of the year. The Yankees offense was pretty brutal during the rest of this game to say the least though. They were facing Hisashi Iwakuma, who came into the game with an 1-2 record and a 4.86 ERA, but managed to basically shut the Yankees down for five innings despite throwing almost as many pitches (94) as Nova did. The Yankees continuously let Iwakuma off the hook, blowing a few opportunities, going 2-10 with RISP before the eighth inning and stranding eight men on base overall in this one. Yep, pretty brutal… at least until the eighth. Jeter started the inning off by getting hit by a pitch (can we start hitting people back at some point? This is getting absurd), Canó singled him to second and Teixeira loaded the bases with a single of his own. Predictably (because even when they have a rally, the Yankees have to blow at least one chance to score) Granderson popped out to the third baseman in foul territory, which brought up Ibañez’s spot in the order against Luetge, the tough lefty from game two. Girardi actually learned his lesson and went to Jayson Nix instead, and Eric Wedge countered by bringing in the right-hander, Shawn Kelley. It didn’t matter. Nix got a hanging slider on 2-2 and buried it into the left-center field gap for a bases clearing, sigh of relief double. 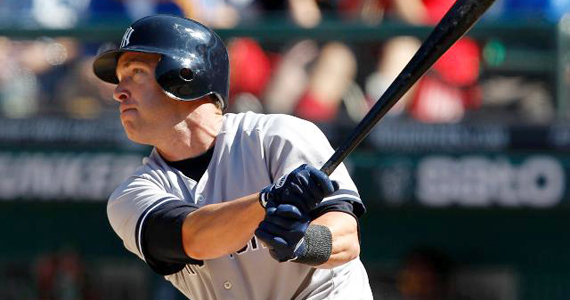 The Yankees led 4-2, and they tacked on a run when Russell Martin singled to left to score Nix. Nix is now 2-3 pinch-hitting on the season, and his hit was by far the biggest the Yankees had in maybe the whole road trip. What seemed like a pretty inconsequential series turned into a possible turning point in the season for the Yankees, for both good and bad reasons. They took two out of three to stop their four game losing streak, gained a future Hall of Famer to finally replace Brett Gardner permanently, and lost another HOFer, their third baseman, to a broken hand. It was a pretty tumultuous series in Seattle, but, in the end, I think the team will be alright. Ichiro should fill the void left by Gardner pretty well, and, as I said the other day, I think he’ll see a bit of an uptick in his production with this new found motivation. A-Rod will not be easy to replace. 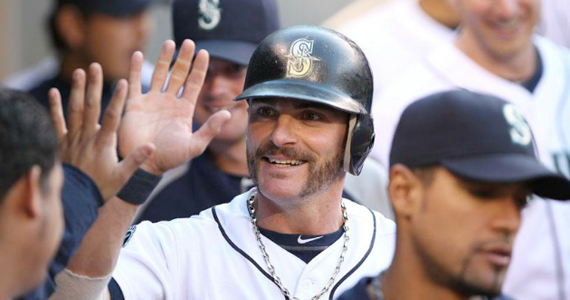 He definitely hasn’t been hitting like the A-Rod of old, but he’s definitely better than Jayson Nix/Eric Chavez. 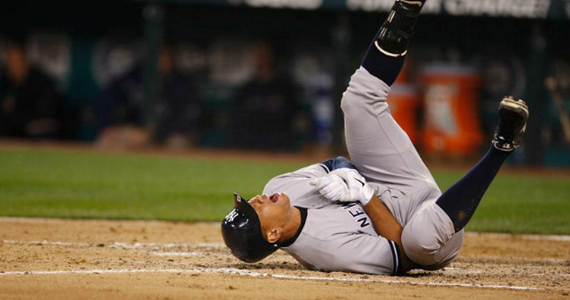 If there is any silver lining here, it’s that A-Rod got hurt before the trade deadline and not after. This gives the Yankees a lot of options for replacing him. I’m curious to see what Brian Cashman decides to do (hopefully calling up Ramiro Peña is not it), but I have faith that the team will make it through this injury. Go look at the ESPN Yankees blog. Apparently, A-Rod is actually quite easy to replace, at least over the past couple of years. Hope that’s the case now.